The Baci-Cinerator IV sterilizes by infrared heat (Heater Element contains no asbestos) – organic material is incinerated deep inside the ceramic tunnel. To use, simply insert loop or needle into the tunnel. 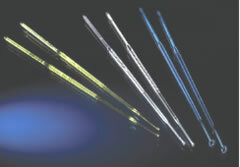 Complete sterilization takes only 5 to 7 seconds at optimum sterilizing temperature of 1,500°F. There is no need to wait for the loops or needles to turn red. Unit does not require oxygen so it can be used in anaerobic chambers. Operates on 120V, 60Hz. UL approved. 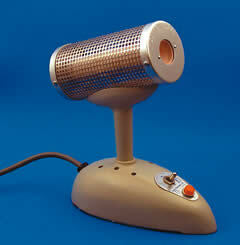 The BactiZapper™ has an asbestos-free core element that uses infrared heating to produce 815°C (1500°F). 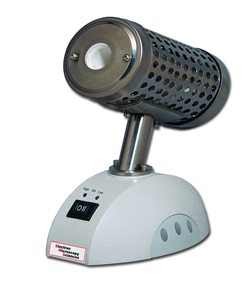 It completely sterilizes microorganisms in 5-7 seconds. The BactiZapper™ uses well-proven technology to provide instant sterilization of platinum inoculating loops, needles, glass tube / pipette mouths and various metal & borosilicate glass instruments used in quality control and research. It also has a lower temperature setting (500°C) that can be used as a "standby" and extends usable life. These sterile, disposable, plastic loops and needles are designed for use in quantitative procedures such as sampling, urine counts and serial dilutions, as well as for bacterial inoculation. Because they are pre-sterilized and designed for single use, there is no risk of cross-contamination and no need for flaming. They are flexible enough for streaking, yet rigid enough for subsurface inoculation. 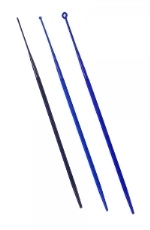 The unique hexaginal shape of the shaft makes it easier to grip, position and guide through a smooth streaking process. The loop surfaces are extremely smooth, with no rough edges and no flashing or burrs on the loop head. This results in the elimination of cutting or gouging of the agar surface. Sterile, disposable and verifiably accurate, these loops provide an efficient, cost-effective and time saving alternative to traditional metallic loops. Nichrome wire. An 8" aluminum handle with a 3" nichrome wire, 25 gauge. Loop O.D. is 4mm; loop I.D. is 2.5 mm. Available with a loop or a needle. The 0.01 ml loops are calibrated to A.P.H.A. Standards and are made from 19 gauge B&S platinum wire with 5% rhodium. The 0.001 ml loops is made from 26 gauge B&S platinum with 15% iridium. Made from 26 gauge B&S platinum wire with 15% iridium to provide rigidity with thinner wire for delicate work. Both ends are ground smooth. Our high quality inoculating loops are made from platinum wire. The 15% iridium adds necessary rigidity permitting thinner wire for delicate work. The loop section is welded and smoothly finished to form a "perfect circle". 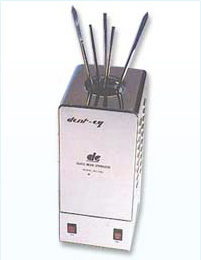 The GERMINATOR 500™ is a convenient effective way to quickly decontaminate your micro-dissecting instruments. No more need for messy chemicals or open flames in the lab, and the small footprint saves bench space! 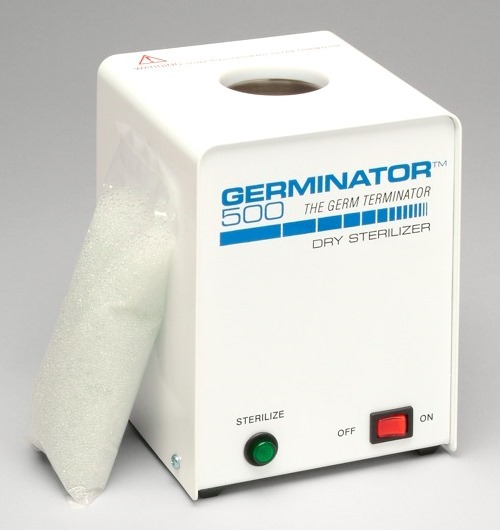 The GERMINATOR 500™ is a simple, inexpensive way to quickly decontaminate your micro-dissecting instruments between procedures. 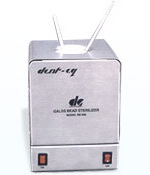 The unique stainless steel glass bead bath remains at a constant 500°F, allowing you to insert the tips of your instruments whenever you wish to decontaminate them. And it's fast... most micro-dissecting instruments decontaminate within 15 seconds! 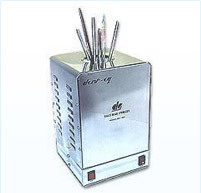 These glass bead sterilizers are quick and easy to use and they are compact and light weight which makes them suitable for table tops or workbenches. They are used to sterilize instruments used in most laboratories and doctors' offices, dentists' offices, clinics, hospitals etc, killing spores and bacteria within 10 seconds! All units are supplied with one filling of glass beads. Glass beads size ranging 1.5 – 2.0 mm diameter. We suggest that glass beads be replaced at least once in three months. Clean the glass beads at least once every 2 weeks. Remove glass beads when the unit is completely cool. Wash with mild soap, rinse and dry thoroughly before re-use. A micro spoon and spatula made from nickel stainless steel and coated with a glazed finish resin on the handle. The wire is 0.103" (2.62 mm) in diameter. Overall length: 6½" (165 mm). The spoon end length: 1" (25 mm) x ¼" (6.35 mm) wide. A Heyman type micro spatula made from nickel stainless steel with a glazed finish. The wire diameter is 0.103" (2.62 mm). Overall length: 6¼" (159 mm). Flat end: 1¼" (31.35 mm) long. The spoon end: ½" (12.5 mm) long x ⅛" (3 mm) wide. A Heyman type micro spatula made from nickel stainless steel with a glazed finish. The wire diameter is 0.103" (2.63 mm). Overall length: 6¼" (159 mm). Sharpened bent end: 1½" (37.5 mm) long. V-Shaped formed other end: ½" long. 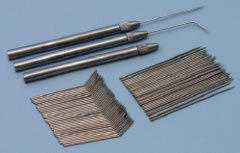 We offer a selection of stainless steel spatulas – a "must tool" when handling embedding wax.